Blurb Description: Those were the best days of our lives . . .
For Aadi, Srini, Ambi, TD, Miru and Kajo, the twentieth anniversary reunion of their batch from IIM Calcutta provides the perfect opportunity to set aside their everyday anxieties and relive the heady days of their youth. But things beginto go awry when ex-lovers reunite, old grudges resurface and long-held secrets come tumbling out. As they navigate an eventful weekend in Goa packed with expected nostalgia and unexpected drama, what becomes increasingly clear is that while friends are fallible, friendships are forever . 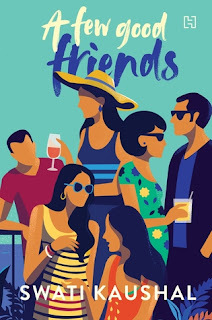 . .
Sparkling with wit, warmth and the easy craft that has marked Swati Kaushal’s bestselling novels, A Few Good Friends is a refreshing, nuanced take on friendship, love and this crazy thing called life. I haven’t spoken about it before (mostly because it scares me a little) but my tastes have started moving towards more adult books during the last year. I AM in the last year of my teens and perhaps it’s time, but that doesn’t mean I’m still not a little scared about what all the adult books in the world might hold for me. Which brings me to the time when a lovely publicist at Hachette India pitched me this gorgeous looking and sounding INDIAN adult contemporary novel set in a place I JUST VISITED with my college friends and I was SOLD. I dove into Swati Kaushal’s book about a week ago, and it took me a while to get into it. I’m currently at a place in my life that is twenty or so years away from where this book is, and that very fact made it a little difficult to connect with the characters. 1. The first thing that hit me was the sheer number of characters in this book, which, needless to say, was a LOT. Told from six – or so – points of view, with the cast of characters having names and pet names, I STUMBLED OVER MYSELF trying to remember all of them. I DON’T HAVE THIS MUCH BRAIN POWER, OKAY? 2. After I did get to know all the characters a little, I was a little more able to sit back and enjoy the story without wondering ‘WHO IS THIS PERSON?’ and ‘WHAT HAPPENED WITH THEM IN THE LAST CHAPTER?’ but it was a disconcerting experience as a whole. 3. I did end up liking all of the characters in this book, but especially TD and Miru. Swati Kaushal’s writing really brought out the friendship and the love and the loss between them as everyone in this book went through a personal journey during their reunion. ✨Reply with your favourite 2017 read by an Indian Author! 4. I will admit that this book also scared me a little, looking at a future and what kind of lives are in store for all of us. I’m at a point where I’m not sure what’s coming next for me and this book was a reality check as well as a slight shock. 5. As I sit here thinking about the book, I can’t help but wish that there had been MORE to it. It was a very slow paced book with one major plotline for each character and I WANTED MORE. I wanted more memories, more flashbacks, more fun and more love and I wish that A Few Good Friends had given it to me. All in all, it was definitely a different book from what I’ve been reading, and that was definitely a good thing. A Few Good Friends was a sparkling tale on life and friendship, love and growing up that I enjoyed but I also wish was better paced. 3 stars. 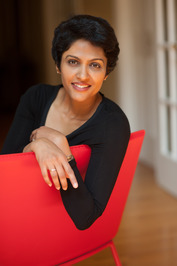 Swati Kaushal is the bestselling author of Lethal Spice, Drop Dead, A Girl Like Me and Piece of Cake. She was born in New Delhi, India, in a time before computers, cell phones, or social media. Despite these devastating privations, she has only happy memories of her childhood; of playing with her friends, of ice cream carts and orange bars, and of reading, reading, reading, to her heart’s content. Swati grew up in Delhi reading mysteries and romances tucked inside her physics and chemistry textbooks, thereby shattering forever her chances of winning the Nobel prize in Physics or Chemistry. What are some of your favourite fictional friendships? What are some of your favourtite desi books of 2017? I'd love to hear from you and also, DON'T FORGET TO ENTER THE GIVEAWAY!